KAMELOT - POETRY FOR THE POISONED LTD. EDIT. (CD+DVD DIGI) | Online Shop | Wizard LTD. Album: "POETRY FOR THE POISONED LTD. EDIT. 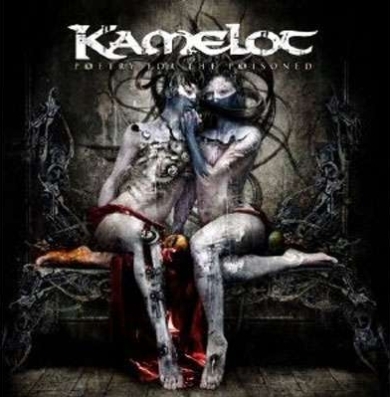 (CD+DVD DIGI)"
KAMELOT&apos;s reputation among fans and media alike is marked by enthusiasm as well as esteem, with each of its eight studio albums to date surpassing its predecessor in terms of songwriting, production and commercial results. As one of the most difficult-to-categorize artists on the metal scene, KAMELOT is ready to release its most insightful and ambitious album to date, "Poetry for the Poisoned". Throughout the recent years, KAMELOT&apos;s releases have achieved cult status around the world, and "Poetry for the Poisoned" will "once again raise the bar for others to follow," according to a press release. "The new studio album blends their trademark KAMELOT sound with new elements and a creation of musical art that will set a new standard in the genre." "Poetry for the Poisoned" features guest appearances by Simone Simons (EPICA), Gus G. (OZZY OSBOURNE, FIREWIND), Bjцrn "Speed" Strid (SOILWORK) and Jon Oliva (SAVATAGE, JON OLIVA&apos;S PAIN). The artwork was created by many great artists, including Seth Siro Anton, Natalie Shau and Michal Loranc. "&apos;Poetry For The Poisoned&apos; is a mix of progressive elements, modern rock, dark arts and also power metal," states Youngblood. "It comes at a time where many people around the world are searching for something to grab on to spiritually, including myself. I recently lost my mother and to be honest it was very hard on me. So there are some melancholy moods reflected on this album." Frontman Roy Khan assures that "Poetry for the Poisoned" will both please the band&apos;s existing following and expose the universe of KAMELOT to a whole range of new fans. "&apos;Poetry for the Poisoned&apos; is our longest and toughest production so far, but when I hear the result I know it was well worth the struggle," he says. * "Pick and Play" for the song "The Great Pandemonium"
Simone Simons (Epica) - vocals on "House on a Hill" and "Poetry for the Poisoned, Pt. II-III"
Bjorn "Speed" Strid (Soilwork) - screams on "The Great Pandemonium"
Jon Oliva (Savatage, Jon Oliva&apos;s Pain, Trans-Siberian Orchestra) - vocals on "The Zodiac"
Gus G. (Firewind, Ozzy Osbourne) - guitar solo on "Hunter&apos;s Season"
Amanda Somerville - choir vocals on "Poetry for the Poisoned, Pt. I-IV" and vocals on "The Zodiac". Chanty Wunder - Female vocals on "Where the Wild Roses Grow"